Pancreatic beta cells of the islets of Langerhans play an important role in the control of blood glucose levels by secreting insulin in response to an increase in extracellular glucose concentration. Increased glucose concentration also induces rhythmical electrical activity in beta cells. This activity consists of the periodic plateaus and spikes of Ca2+-dependent action potentials, which enhance Ca2+ influx and insulin secretion. Two KCa channels are present in beta cells: a voltage dependent, "fast", large conductance KCa, and a slowly activating and deactivating KCa current, Kslow. Kslow is thought to be responsible for islet pacemaking. Experimental data suggest that both cytosolic calcium and calcium from the endoplasmic reticulum (ER) play an essential role in the activation of Kslow channels. In their 2002 paper, P.B. Goforth, R. Bertram, F.A. Khan, M. Zhang, A. Sherman, and L.S. Satin develop two mathematical models to test this theory (see the figure below). Their first minimal model lacks a separate subspace, and they found that this two component model (cytosol and ER) was insufficient to explain Ca2+-induced activation of Kslow channels. However, their second model incorporated a localised pool of Ca2+ in a subspace located between the plasma membrane and the ER. In this model, subspace [Ca2+] is positively correlated with changes in cytosolic [Ca2+], but with a gradient that reflects Ca2+ efflux from the ER. The simulations from this model were consistent with experimental data. Schematic diagram of the model of Kslow activation by Ca2+. Ca2+ entering the beta-cell through voltage gated Ca2+ channels (ICa ) is either pumped out of the cell by the Ca2+ ATPase (JPMCA ), or by Na+/Ca2+ exchange, or it is pumped into the ER by SERCA (JSERCA ). Ca2+ leaves the ER through specialised channels close to the Kslow channels (JRELEASE and JX ). This produces a local calcium concentration gradient in the subspace. 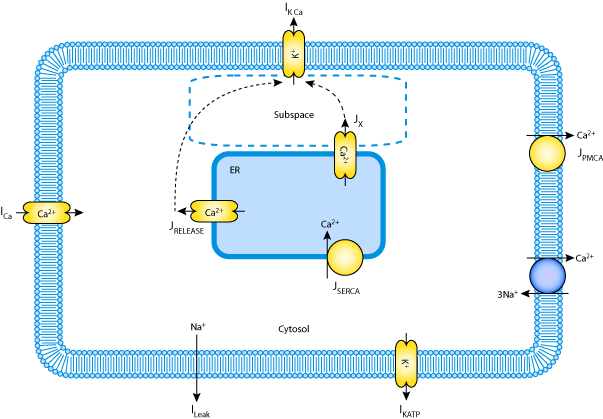 Subspace calcium is passively exchanged with cytosolic calcium. Derived from workspace Goforth, Bertram, Khan, Zhang, Sherman, Satin, 2002 at changeset 2cbf945d5b2c.